It’s 15 years since Richard Curtis’s Love Actually hit cinema screens. We understand if you need a moment to take this in. A wildly ambitious offering, in which eight separate love stories intertwine in the weeks leading up to Christmas (yes, we think that’s the best way of describing it), Curtis’s cherished rom-com has, over the years, become a bona-fide Christmas classic. Yes, it is an odd, odd film. Yes, it is deeply problematic, when you really stop to think about it (especially that scene with Andrew Lincoln and his giant cue cards - yikes). No, it hasn’t aged all that well. You know the one - it gets us every time. And, it probably deserves a better film. 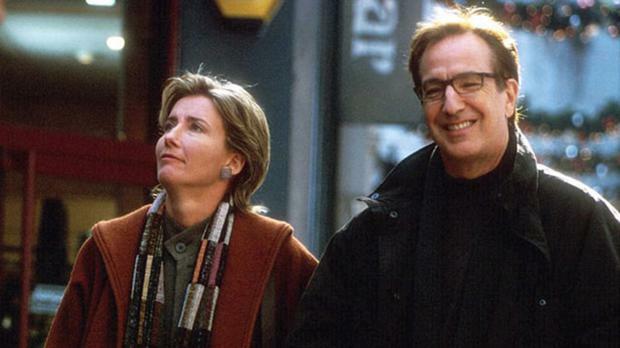 Basically, Harry (the late, great Alan Rickman) starts an affair with his secretary, Mia (Heike Makatsch). He secretly purchases her a necklace for Christmas – a necklace which his wife, Karen (Emma Thompson), finds before he has a chance to hide it. She thinks it’s for her and, well, let’s just say that things get complicated on Christmas Eve. Oh, and Joni Mitchell is involved. 5. We actually got a sequel! In 1994, the lads from Wet Wet Wet were asked to record a cover for Richard Curtis’s new romantic comedy, Four Weddings and a Funeral. You know what happened next. Love is All Around spent 15 weeks at number one, folks. Even the band’s front man, Marti Pellow, admitted that the tune eventually did everyone’s heads in. Curtis must have known this, too – and, in 2003, for Love Actually, guess how he decided to kick off the film? Yep, with a Christmas-themed cover of Love is All Around (Christmas is All Around), recorded by Bill Nighy (as fictional rock god, Billy Mack). That’s right: Curtis somehow found a way to simultaneously poke fun at himself whilst making the song even more annoying than it is. That’s quite an achievement. It’s the best line in the whole film, and it deserves some sort of award. No, really. Yes, we have decided to blame Love Actually on every other romantic comedy where loads of seemingly unrelated, love duvey things happen to people who are far too good looking for us to really care about. These include Valentine’s Day (2010), New Year’s Eve (2011) and Mother’s Day (2016), all of which would never have found their place in the world were it not for Curtis’s film – and all of which were directed by the late Garry Marshall. Love Actually also inspired a 2013 Japanese reimagining of sorts, entitled ‘It All Began When I Met You’. No, really. And, he didn’t want to do the 10 Downing Street Shuffle (that’s what we’re calling it, anyway). Apparently, he thought it too unrealistic (he’s right) and worried it would be stupid (it was). "Well, I could see that it might work," Grant told an interviewer earlier this year. “Although I never understood it, technically. I kept saying to Richard, 'Okay, look. I've got the radio in my room. My bedroom. And I'm dancing, fine. But then I started dancing through the whole of 10 Downing Street, where's the music coming from? How does it cut off at the end?'" Curtis’s response? “Oh, don’t worry about all of that. It's film world.” Good point, Richard. Broadcaster, writer and Love Actually script editor, Emma Freud (who is also Curtis’s wife) revealed a few years back, via Twitter, something rather startling about Rowan Atkinson’s character in Love Actually. Are you ready for this? “Originally Rowan's character over-wrapped the gift on purpose to stop Alan Rickman being able to buy the necklace. Because he was an angel,” she tweeted. And now we need to go and lie down. What we mean is that it happened in the film – in ‘film world’ (but we didn’t get to see it). The aforementioned Freud also revealed this delightful ‘fact’ via Twitter a few years back. This is all getting very upsetting. Let’s finish with something a little more upbeat, shall we? And all the cue cards in the world will never, ever change that. Now, we kinda feel better, actually. Enjoy your next viewing!